So for about the last two months I’ve taken to the road. I don’t drive and live at the end of a comparatively flat cycle path so it barely makes sense for me NOT to cycle into my day job in Belfast City Centre. I’ve cycled before but this year I’ve really been bitten by the bug. I get bad-tempered if the weather is too bad for two wheels and any journey or outing is accompanied by the question, ‘can I get there by bike?’. I’m not going to bore you with bike specs and that kind of thing but here are some things I’ve learned in the last couple of months. Even if it’s not raining and it’s not windy your hair won’t look like it did when you left the house. Invest in dry shampoo – my favourites are Batiste and Pantene – and a good hairbrush. An anorak with a hood and a baseball cap are now firm favourites for me. 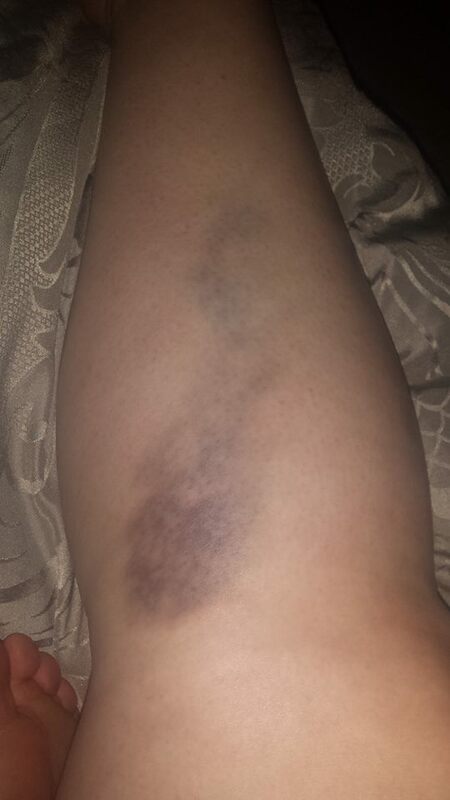 Now I will admit that I bruise like a peach bit it’s astonishing the bumps and bangs you get with cycling. Most of the time they’re on my shins when I bang into pedals and I’m currently sporting a huge purple one on my lower leg simply from banging it on the back carrier as I was swinging my leg over. Check out this bad boy! I also ended up with purple knees a little while ago when I came off my bike (this is an occupational hazard but not a common occurrence). Time to break out the arnica gel. As there are no showers in my office and I’m not going to be breaking any speed records any time soon, I cycle in my work clothes. This doesn’t present many challenges with my dress and tights but accessories can be a challenge. I now keep a separate handbag at work and use my day-glo rucksack to transport stuff to and from. It is naff but it’s the most comfortable way to carry things and has the bonus of extra visibility on dull days. I also keep a baseball cap handy. Again, not the most stylish items but I find it’s best way to keep rain out of your face and eyes – and there is a fair bit of rain in Belfast! Obviously I knew cycling is good for you but I’ve really felt the benefits. I have dodgy knees and after a few weeks of cycling I can safely say they’ve considerably improved – the muscles in my legs are getting stronger and supporting my knees better. Yes, I might arrive into work soaked to the skin and yes, falling off your bike into mucky puddles is bad but cycling is a glorious way to travel and fills you full of positive endorphins. After the initial outlay on a bike (mine cost approx. £130 in Decathlon), lock and so on it costs nothing and it’s estimated that people who cycle into work lose 13lbs in the first year alone. I also find it’s an incentive to eat better. I need enough energy for a 30 minute cycle to and from work so I pay attention to where it comes from now. I’m much less likely to go for sugary things or caffeine in the afternoons and my water intact has upped considerably. I’ve always said that Belfast in the sunshine is a gorgeous place to be. 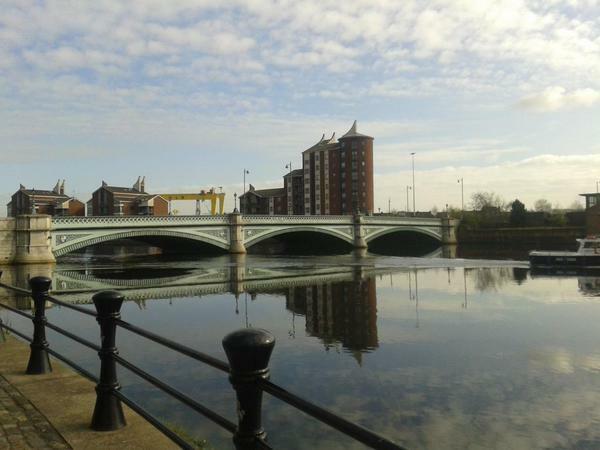 Now, cycling along the Lagan each morning, I get a front row seat. 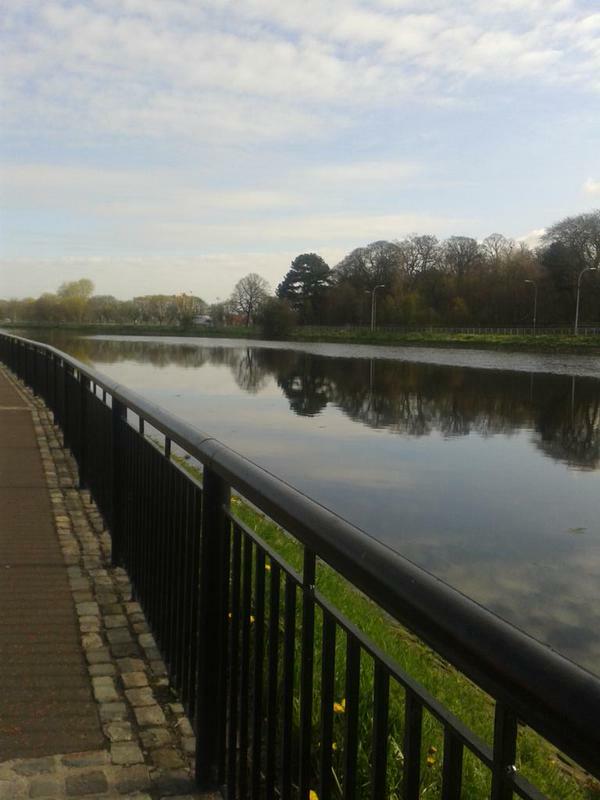 It’s so tranquil along the Stranmillis and Ormeau Embankments and in the morning I see a lot of other cyclists, runners and rowers. 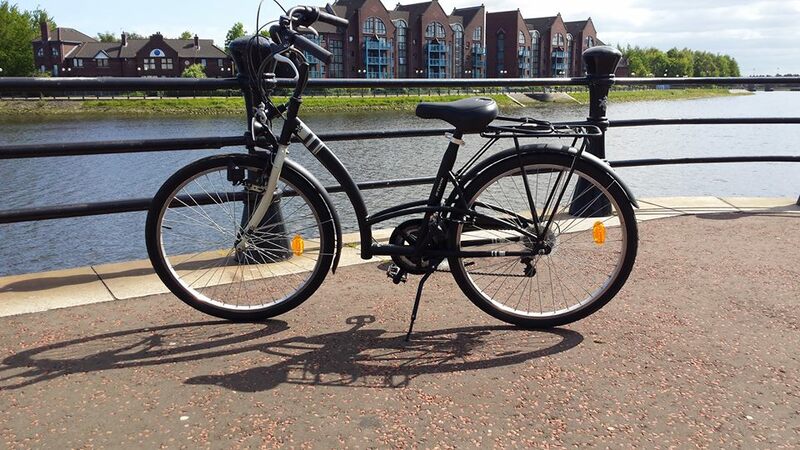 There’s a lot more to say about cycling in Belfast – particularly with the arrival of the Belfast Bikes. I’m not going to talk about strategy or politics but if you’re interested absolutely check out the NI Greenways blog, this guy really knows what he’s talking about. So you can expect more cycling posts but we’ll leave it here for now!